The Asahi Shimbun looked at several of these buildings. 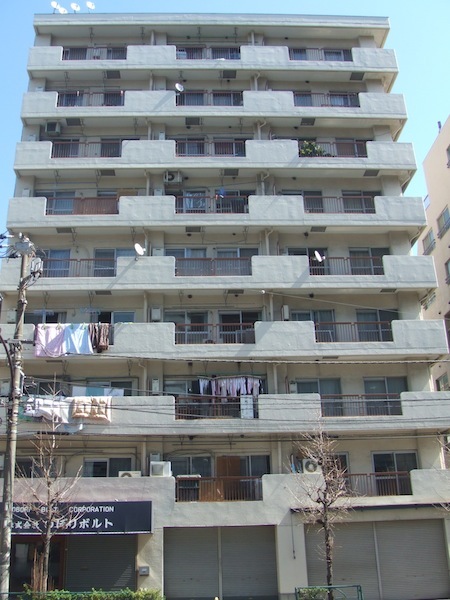 One, the somewhat optimistically named Sunny Heights Takasago, was built in 1976 and was actually damaged in 1978 during a large earthquake that struck Sendai. However, the damage wasn’t “complete” and repairs were made. The building was not so lucky this time. The condominium is actually two 14-story buildings positioned in an L-shape. During the initital earthquake the two structures knocked against each other, but afterward inspectors declared them yochui–residents should take caution but they could keep living there. But the condos sustained further damage in the aftershock of April 7: window and door frames deformed, cracks appeared on outside corridors, steel beams were exposed. Even worse, the ground itself was “damaged.” Consequently, the properties were condemned. The main problem now is how the 400 residents, who have already evacuated the condo, will proceed. The estimated cost to rebuild the entire condo is ¥3 billion, or about ¥16 million per unit. Thanks to an emergency city law that was passed after the earthquake, the local government will pay the cost of tearing the structure down. According to a national law (Kubun Shoyu-ho) that oversees the maintenance of common property, such as condos, the consent of at least four-fifths of the owners of a collective property is needed for it to be rebuilt, and at least half the owners’ consent is needed for “full-scale repairs.” However, there is nothing in the law about just tearing a structure down. Consequently, the Civil Code takes precedent, and it states that in order to dispose of common property 100 percent of the owners must give their consent. This was a problem, because not all of the owners of condos in Sunny Heights Takasago lived there. Some rented out their units to tenants. Others lived elsewhere–overseas even–and had left their units vacant, all the while paying property taxes and management/repair fees. But they couldn’t be reached easily, so for at least two months the owners’ fates were in limbo, because they couldn’t live there and they couldn’t start rebuilding until the structures were torn down. Finally, at the end of June they succeeded in receiving consent from all the owners. Demolition will start in the autumn. Now, the owners who want to rebuild will have to convince enough of their neighbors to go along with them in order to reach a four-fifths consensus. Otherwise, they’ll have to start from scratch, which will mean buying out the “properties” (an amorphous term for condos, since it includes empty cubic space as well as a small portion of the land the building stands on) of those who don’t want to rebuild. There are dozens of other condos in Sendai going through the same situation, and according to the Asahi 272 other buildings that need large-scale repairs, which means the owners associations of all these condos will also have to come to some sort of agreement before they can do anything with their properties. It’s a huge mess, and one that should have been anticipated years ago. Usually, when condos are about thirty years old the owners vote to make major repairs or rebuild, but the law is so incomplete that in many cases they can’t go forward, especially if in the meantime local zoning ordinances have been changed that limit the kind of repairs or reconstruction that can be carried out. What the disaster has demonstrated is that development of housing projects went ahead before the relevant authorities had any clear concept of what the legal rights and responsibilities of owners of collective properties should be. It shouldn’t have taken a disaster of this magnitude to figure this out. Another great post revealing the ugly fact that Japan’s housing market is akin to that of a developing country. You’re _not indemnified_ if the ground under you liquifies or if your building is found to be structurally unsound. Caveat emptor indeed.